This article is for the 4★ Martha. For the 4★ , see Martha. Apply Debuff Immunity to yourself (1 time). Increase Buster Card performance of all allies by 15% while she is on the field. With an iron fist that cleaves steel. 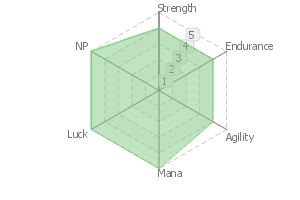 With a hardened fist that pierces dragon hide. This body definitely exists for the sake of others. That aside, don't think just because it's summer I'll allow you to laze about. Sometimes it is possible to notice her self from "those times" before receiving the holy staff. This happens more often than when she is manifested as a Rider. 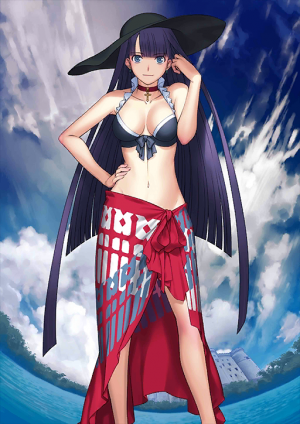 As she loses her holy staff and holy roes when she manifests in her swimsuit, Martha has no choice but to stop any conflicts with her bare hands. It is not a brawl. It is an intervention. The Holy Maiden has been released empty-handed... the Dragon Slayer (bare handed)... don't bring up any of that stuff to her. 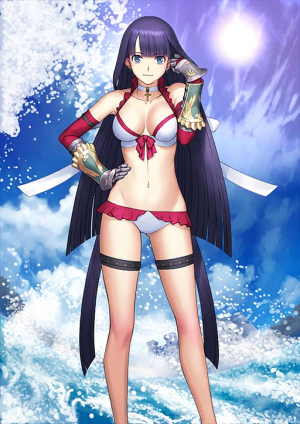 As Martha gained control of Tarasque near the bank of the Rhone River after drifting ona boat, she is deeply related to water. 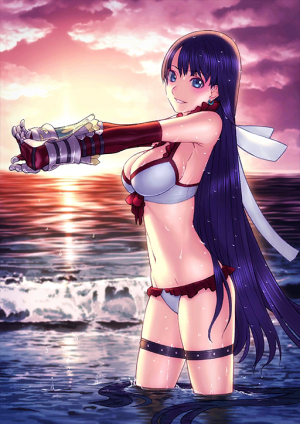 By being in a swimsuit, that attribute is enhanced, Martha's attack raises once she is near water. She is on board to do anything. 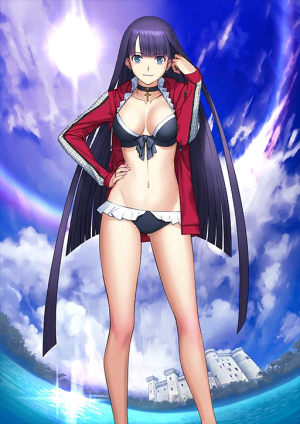 Martha without her holy robes possesses a perfect body. Pretty impressive once you get a look. This is a skill that puts that perfection on display, and it also functions as a Charm skill to others. An ancient fighting style passed down from Jacob, to Moses, and finally to Martha. If mastered, one can even win against an Archangel. Legend says that a saint who mastered this style would destroy the "Angel of Death" who led a legion of 12,000 angels. 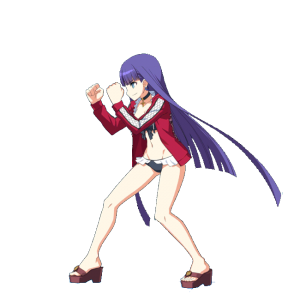 Martha's demeanor after releasing her Noble Phantasm's True Name is because of this skill. Her appearance and words might be different, but her nature never changes. She is still the perfect holy maiden who strives to save the world and mankind. Yet this is still a special summoning. Could it be - as she claims - the Master's test, or could it be something else? With a single iron fist, she splits steel. With a single strong fist, she pierces even a dragon. Carrying the words of the messiah (that person) in her heart, even now she has not forgotten the oath of a holy woman. ---this body surely exists for the sake of the people. That aside, I won't allow a slacken life-style just because it is summer! It is possible to catch glimpses of signs of "those times" from before she had the holy cane. If compared to when materializing as a Rider, the frequency is somewhat higher. 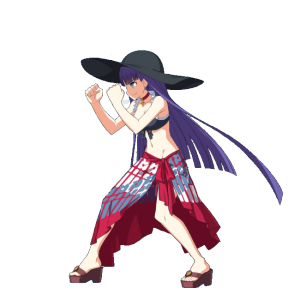 Since she lost the holy garments and holy cane to manifest in a swimsuit, Martha has no other choice but to stop conflict with her bare hands. This cannot be helped. It is not conflict. It is mediation. The holy woman finally ended up being released empty-handed... a dragon-slayer (unarmed)... and the likes must not be mentioned. Having drifted on top of a boat and reined in the Tarrasque at the Rhone's riverbank, Martha has deep connections to water. Said disposition was strengthened by wearing a swimsuit at this occasion. Upon perceiving a waterside, Martha's attack power raises. She gets on board. Martha's body, which was undressed from holy garments, is perfect as a living being. Amazing when undressed. A Skill that denotes the absoluteness of the body, but it also functions as a fascination-Skill towards others. A method of hand-to-hand combat of old that was continuously inherited from Jacob, to Moses, and finally to Martha. According to legends, a saint who mastered this for sure would beat to death an "angel of destruction" that leads 12,000 angels. 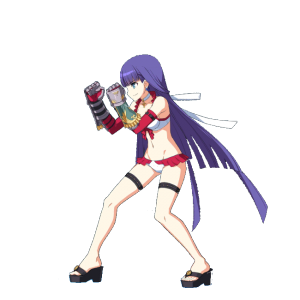 The reason why Martha can "behave like that" when releasing the True Name of the Noble Phantasm, is also thanks to this Skill. Even if she change her appearance, or if there are some differences in her words, she is still her. Nothing but a perfect holy woman who strives to save the world and people. Martha (Ruler) is the first 4★ Ruler. 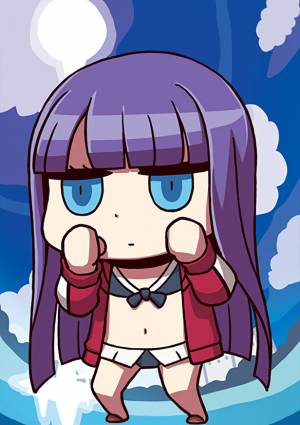 Martha (Ruler) is the first and only Ruler to have 3 Buster cards in her deck (Excluding NP). This page was last modified on 29 January 2019, at 08:41.